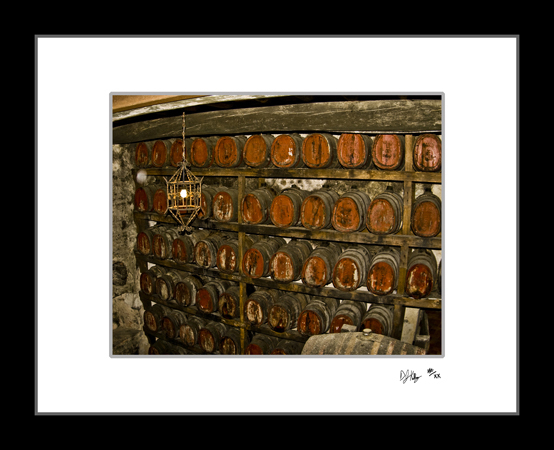 This photograph of the wine barrels inside Castello Poppiano captures the wonderful color and texture found throughout this castle. The castle of Poppiano is located in the hills of Tuscany approximately 45 minutes outside of Florence, Italy. These barrels are used to age the wines created in the vineyards surrounding the castle. This print is a limited edition print. This edition is limited to a set of 50 prints. To ensure the value of your investment continues to increase, prices increase after initial 10% of prints are sold and again when less then 10% of prints remain. Contact Damian to discuss custom orders of this print. The buttons above process the order through PayPal. Multiple items may be placed in your cart before the order is finalized. PayPal allows the use of major credit cards and does NOT require you to sign up for an account. Shipping and handling is included in the price above. To pay using a different method or for large quantity orders, please contact Damian to make arrangements. Thank you. the written permission of the photographer.